"I don't want to live this life 'cause this world is so unkind...Although I may try my best, I've still got cupid's arrows in my chest." The choice to make a morbid poem of his final thoughts was meant as a snarky reminder to associates and fellow musicians, T.C wished to be remembered for his untapped potential as a songwriter. Cupid’s Arrows is a harmonious tribute to the artist’s darkest time... however, it sounds surprisingly upbeat despite the forlorn thoughts of tragedy and lost love found with its origin. The perfect choice for anyone who enjoys love songs with inspiring power-pop melodies yet know the darkest side of any romance is always lurking, threatening to make things go horribly wrong... T.C’s message is subtle and it won’t depress you but if you listen carefully, you can still hear the pain in his voice exposing the truth of a broken heart. Cupid’s Arrows is available for download now on iTunes, Amazon and Google Play... just in time for Valentine’s Day! 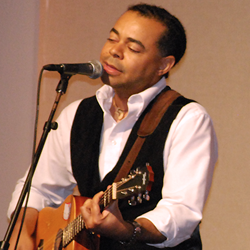 T.C Urquhart is an award-winning singer/songwriter based in Fort Lauderdale, Florida who performs & travels extensively. He was a frontman for the popular Miami-based rock group kNiption FiT and his first solo release for 2016 is “Cupid’s Arrows” to be followed by an EP set for release later in the year.